Royal Zambezi Lodge can be found in the Chiawa Game Management Area, just a few kilometers from the Lower Zambezi National Park. Royal provides a perfect romantic setting for honeymoon couples as well as offering a customised family suite for larger groups. The central building and individual private suites are designed so that guests have a full nature experience. 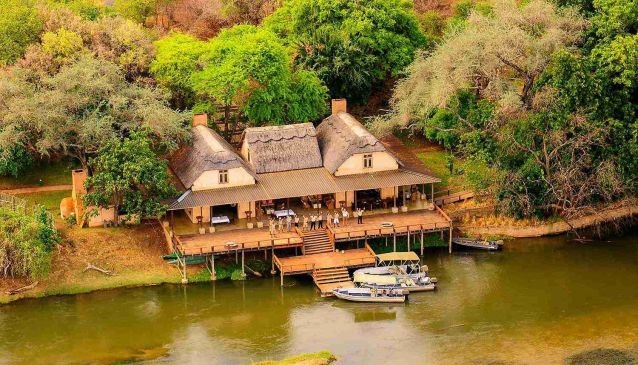 The lodge offers a wide range of activities that guests can choose from including game viewing, canoeing on the Zambezi river, fishing and the Royal Bush Spa. The bar and deck are the perfect relaxing place to end the day and watch the sunset. Royal Zambezi Lodge is a the sister company to Royal Air Charters.